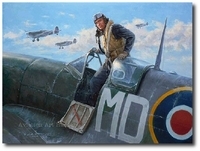 French Ace Pierre Clostermann flying his Supermarine Spitfire LF 1XC "LO-D" 602 Sqn. 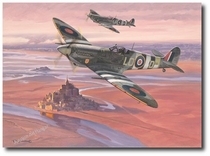 over Mont Saint Michel on D-Day. 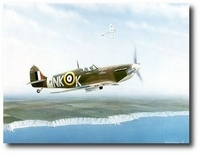 In the background you can see smoke from the battle on the Normandy beaches. 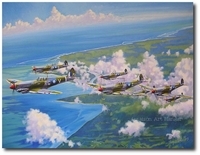 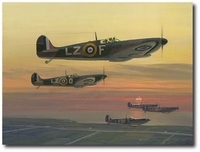 Perhaps no other combat aircraft in history can match the reputation of the Spitfire. 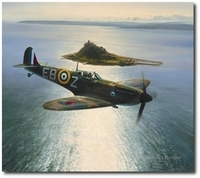 In the eyes of the British public, the performance of this aircraft, more than any other factor, decided the outcome of the Battle of Britain and changed the course of World War II. 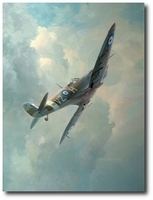 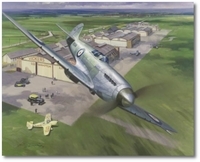 The first all-metal fighter to be produced for the RAF (Royal Air Force), the Spitfire was noted for its sleek design and unique thin, oval wings. 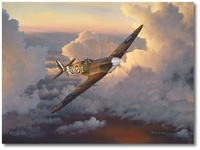 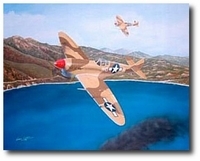 While the Hurricane evolved from a biplane design, the Spitfire was designed as a monoplane from the start. 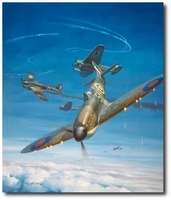 And while the Hurricane outnumbered the Spitfire in 1940 and shot down more German aircraft, the Spitfire captured the imagination of the British people. 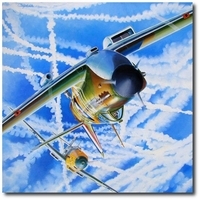 26-Signature Tribute Edition in Stock! 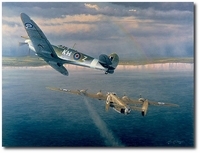 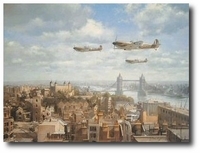 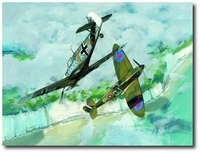 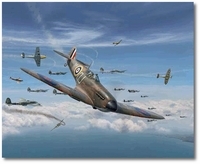 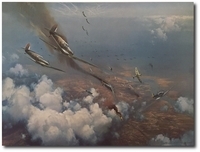 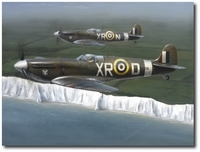 "First Light - Battle of Britain, July 1940"
"Spitfires - Masters of the Air"
"With Glory Gained and Duty Done"